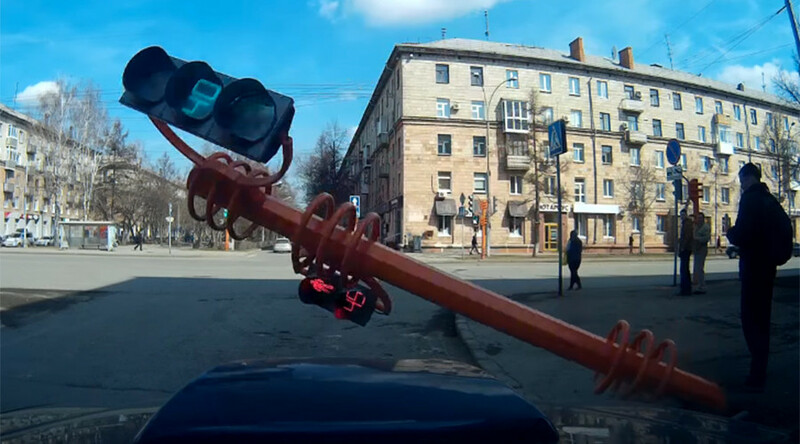 A concerned passerby ended up with a DIY disaster on his hands after he apparently tried to fix a faulty traffic light on a Russian street. The pedestrian was crossing the road when he noticed the traffic light wasn’t working correctly and decided to pick up a piece of wood conveniently lying nearby and prod at the fixture. After a few seconds of poking the swaying structure the passerby seemed satisfied he had stopped the light from flashing. However, as he went to turn away the entire pole toppled to the ground, smashing the light in the process. The incident was captured on dashcam by a car stopped at the intersection. Despite the unintentional debacle the pedestrian seemed incredibly unfazed by the traffic light’s collapse. He stood calmly at the scene, appearing to look at his phone as the stopped car reversed slightly away from the collapsed light. Before the footage ends another individual goes over to examine the smash – but the guy who caused the destruction continues to ignore it. It’s unclear whether the pedestrian reported the incident or waited for authorities.